America is the land of the free and the home of the brave. Which is why the freedom for a woman to choose what she does with her own body must be protected. Many brave women and men fought for that right, which resulted in the Roe v. Wade decision. And people continue to fight for that right every day. This is not the only battle being fought for women’s reproductive rights — and the fight is far from over. I’ve written about this before in detail and I’m pro-choice. I believe every woman should have the freedom to choose whatever she believes is right for her. And my definition of pro-choice encompasses every possible choice a woman might want, or need, to make. 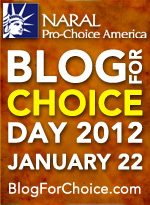 To mark Blog for Choice Day, here’s what I plan to do this year to help get more pro-choice candidates elected. I will continue to stand with our President, who respects women’s reproductive issues. The most recent example? He approved nearly universal insurance coverage for contraception. Availability of birth control can’t be overlooked in a pro-choice conversation. Choosing not to have a baby must start there. Greater access to birth control for all women translates to a decline in unwanted pregnancies. Just you wait and see. I’m going to share facts about reproductive issues and rights at every opportunity. Facts I hope can counteract the angry, ill-informed rhetoric some try to pass off as the truth. Educating people is essential to helping them understand what’s at stake. I’ll communicate the facts about candidates who are either staunchly pro-choice or anti-choice. The public must be fully informed when they cast their vote. I will spread the word about pending legislation that could infringe on a woman’s right to choose. This includes the rights protected by Roe v. Wade but other reproductive issues, such as personhood amendments, can’t be ignored. Any attempt to manipulate or control what a woman does with her body is a violation of her rights. At every opportunity, I’ll tell legislators and elected officials that it’s time to stop trying to meddle in the private business of women’s bodies. I’ll make my voice heard in ways such as signing and sharing the NARAL petition to challenge Speaker Boehner not to hold any anti-choice votes in 2012. I will use my ability to communicate what’s at stake with as many people as I can, however I can. When anyone else tells a woman what she can and can’t do with her body, it’s an assault on her basic human rights. We are the land of the free and the home of the brave. However much bravery it takes, we must fight those who try to take away the freedom of American women. It’s our right, as citizens and human beings, to make our own choices. No, there’s not much here yet. But there will be. I have a pretty busy job. I write a lot, every day. And I tweet what I think with some frequency. But there are times when I have more to say, or just want to say something different. So that’s what this space is for. When topics warrant it. Also, when there’s time. As they say in TV, stay tuned.